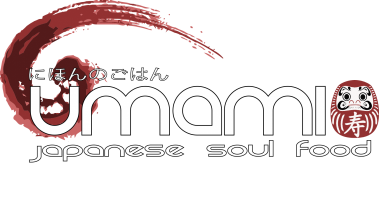 what is japanese soul food?? Japanese soul food – It’s not about fancy stuff like sushi, but rather, Japanese comfort food – things like yakitori, ramen, tempura, fried chicken – and Curry!!! Not to be mistaken for their indian cousins our curries carry a bit of heat with a big Umami kick. 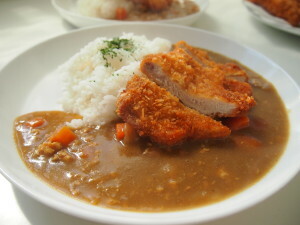 Served with rice and panko(Japanese Breadcrumbs) covered fried chicken, pork or prawns – this dish delivers on Soul!!! Japanese Fried Chicken, humorously known as ‘JFC’ is called karaage in Japan. 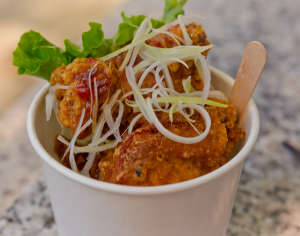 Inspired by Chinese fried chicken recipes this is a delicious izakaya or bento box favourite, comprised of crunchy, deep fried pieces of marinated chicken with a liberal squeeze of lemon juice over the top. 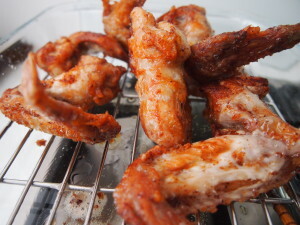 Usually using pieces of chicken thigh we also like to use chicken wings : perfect finger food! This is a street food classic and is one of our favourites, we have tweaked the recipe and naturally its a secret!! Yakitori literally means grilled (yaki) chicken (tori)…but its not as simple as that. Succulent pieces of skewered chicken dipped in what can only be described as Japanese barbeque sauce and grilled to perfection over hot charcoal. 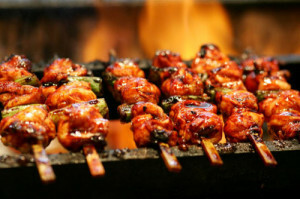 Yakitori stalls pop up all over the streets of Japan with each boasting their marinade is the best. We are just as guilty of that too and hope to bring a taste the Japanese grill to the streets of the UK in the near future. Curried Udon Noodles, Ramen, gyoza, miso soup, okoyomanake…….are just some of the other great Japanese dishes we hope to bring to the streets in the near future. Keep watching this space or out events page to see what dishes will be appearing at future events.